During the summer computer rooms may need extra cooling to keep up with the hot temperatures outside. Small server rooms bring an added layer of complexity to cooling most offices because of their high heat load located in a small confined space. Renting portable spot coolers from Computer Room Uptime is an excellent way to combat the heat generated by IT equipment in your data center. Computer Room Uptime is currently renting spot coolers to a high-tech IT company north of Denver to help supplement their dedicated ceiling mounted Liebert air conditioner. The older 3 Ton Liebert air conditioner was not keeping up with the heat load from their IT network in their data center. Luckily they called Computer Room Uptime to deliver (2) MovinCool Office Pro 12 spot coolers to help cool down their computer room. 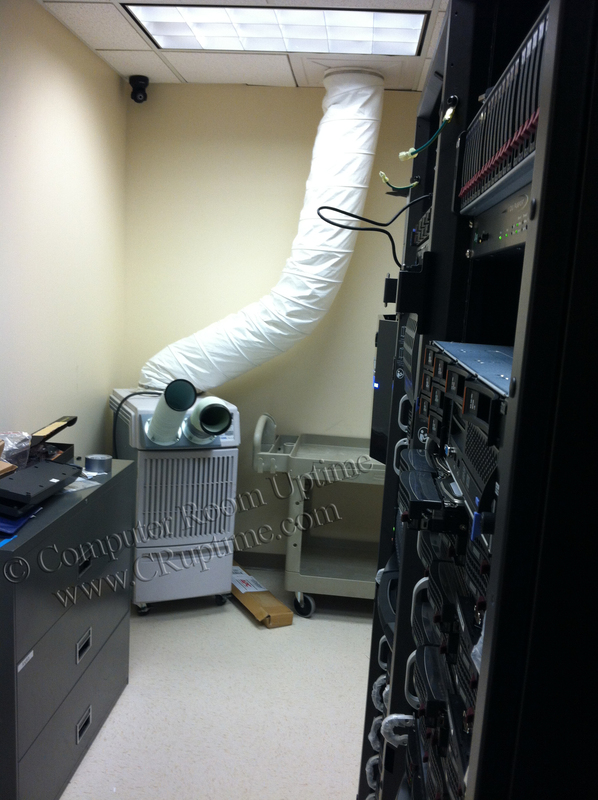 We rolled in our air conditioners to the front of computer cabinets and blanketed the servers with cold air. Additionally, this setup helps promote an efficient cold aisle / hot aisle airflow pattern in in the data center. The spot coolers were able to quickly drop the temperature in front of the servers by 15 °F, bringing down the temperatures to 70 °F. The MovinCool Office Pro 12 is so efficient that it only costs approximately $0.10/hour to operate. Therefore this high-tech IT company north of Denver is cooling their $100,000+ IT network for less than $5.00/day in energy costs using (2) Office Pro 12 spot coolers. Preventing your network from operating in overheated temperatures will avoid costly equipment failures, and provide a faster more reliable network to foster a more productive workforce at your company. If you look at the (2) MovinCool spot coolers as an inexpensive insurance policy to your data center, you’ll sleep better knowing your servers will always be cool. Furthermore you’ll avoid breaking the bank on energy costs too, which is comparable to your daily cup of coffee at Starbucks. 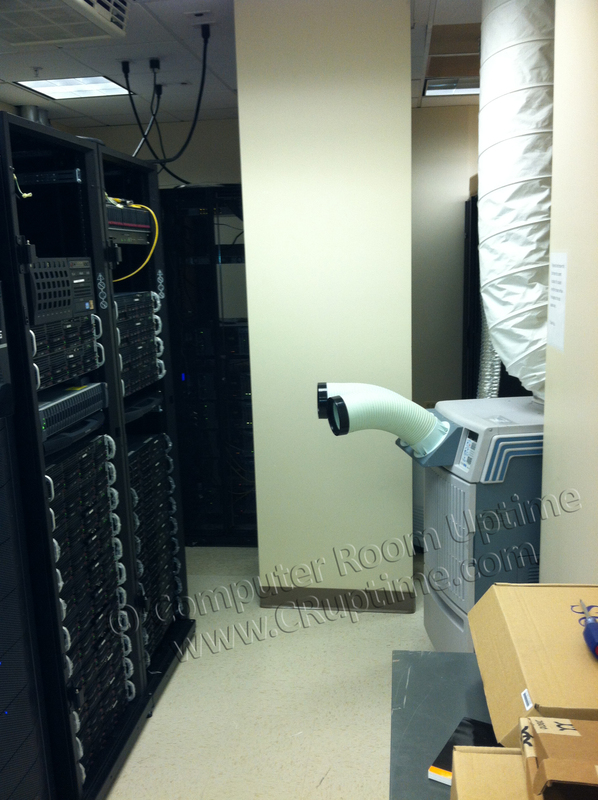 Computer Room Uptime offers several different air conditioning models that operate on 115 V outlets and will cool your down data center quickly and efficiently. The 115 V outlets are plentiful in commercial buildings to simplify installation for spot cooling rentals. The following 115 V MovinCool models all work well in overheated computer rooms: Classic 10, Office Pro 12, Classic Plus 14 and Office Pro 18. These air conditioners range from 10,000 Btu/hr to 16,800 Btu/hr, or approximately 1 to 1.5 Tons of cooling. 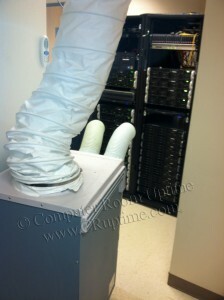 If your data center is more extensive, then a larger spot cooler could be in order. Computer Room Uptime carries several different 208 V/ 230 V MovinCool models to meet your needs: Office Pro 24, Classic Plus 26, Office Pro 36, and Office Pro 60. These air conditioners range from 24,000 Btu/hr. to 60,000 Btu/hr or 2 – 5 Tons of cooling. Since IT equipment often operates on 208 V in data centers, finding a higher voltage outlet is not typically a problem. Computer Room Uptime will work with you on determining the best portable air conditioner to cool your data center. Our expertise can help determine how much cooling is necessary for your server room, and which spot cooler will work best for you. There are pros and cons to using multiple 115 V air conditioners vs. one large 208 V spot cooler. Additionally there are techniques and proven strategies on the best location to set up the portable A/C in your data center. Often times our expertise can cool down your data center with a smaller air conditioner than our competitors will use, saving you lots of money. Computer Room Uptime only has well seasoned professionals with years of experience and knowledge delivering and installing our air conditioners. We analyze and assess each application for optimal efficiency and reliability to ensure your IT equipment is sufficiently cooled. Computer Room Uptime is ready for all your temporary cooling needs throughout the state of Colorado and Wyoming. We have a large rental fleet of portable air conditioners, and deliver them the same day to your Front Range (Denver, Englewood, Colorado Springs, Fort Collins) location from our Denver warehouse. Please call Computer Room Uptime at 303-908-8043 for your next air conditioning rental. . This entry was posted on Tuesday, July 23rd, 2013 at 6:00 pm.